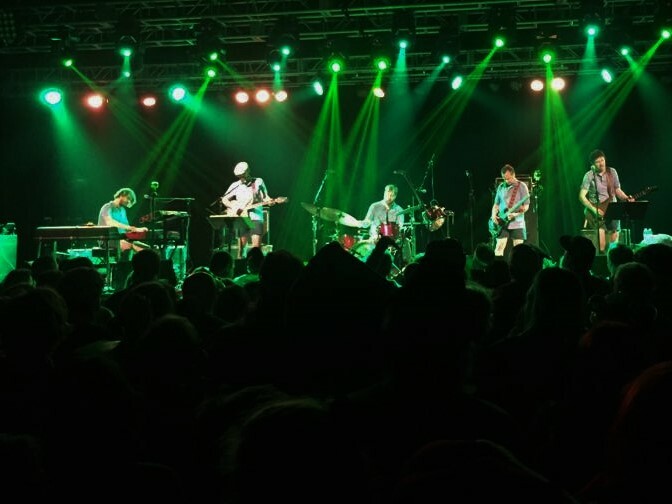 Halloween is a night when things are always bound to get a little weird, and things certainly were pretty “Weir’d” at The Ritz in Raleigh for Joe Russo’s Almost Dead when all five members wore matching costumes of jorts and a blue polo – classic Bob Weir attire. Each of the Bobbys came out firing on all cylinders this night on the opening notes of the all-familiar “Promised Land”. The household and beloved Grateful Dead songs were fresh and filled with crazy psychedelic bliss. The first set barely contained any stops, with one song weaving into the next and then dropping back into full on jams, including a surprise Neil Young cover of “Vampire Blues”. Capping off the set was an especially powerful “Throwing Stones”, which melded into a deep jam, but eventually things that we’d never heard seemed familiar and the opening melody of “Terrapin Station” blasted through to end the set. The second set was more of the same insanity. The opening notes of “St. Stephen” let the crowd know that there would be no slowing down. This set was a strange one for the band, containing almost as many Radiohead covers as Dead covers with “The Bends”, “Killer Cars”, and “Myxomatosis”. Pinnacles of the second half of the night included an explosive “Wheel” into “Uncle John’s Band” that highlighted melodic musical interplay between all members. The band ended the set with a Saturday Dead classic reminding us all to keep partying for “One More Saturday Night”. As the crowd cheered for more the band came back out and tossed prized relics to the crowd. One lucky lady even caught a pair of Tom Hamilton’s Bobby shorts. The band decided to keep with the night’s theme of non-Dead covers and encored with a killer version of the Halloween appropriate “Werewolves of London”, a Warren Zevon cover. Halloween at The Ritz was a whirlwind experience of psychedelic mastery orchestrated by Joe Russo’s Almost Dead. Russo and his Almost Dead have been traveling the country bringing a fresh, new feel to classic Grateful Dead sounds, a unique experience filled with both a sense of unique wonder and good old-fashioned nostalgia that is not to be missed .